Sometimes what happens after two people find their happily ever after isn’t as straightforward as it might first appear to be. I enjoyed reading the descriptions of what it feels like to have anxiety. This is a difficult emotion to fully capture in fiction because so many of its symptoms can easily be mistaken for other issues. Tying them all together takes some talent. Ms. Warner pulled it off so well that I briefly wondered if some of the scenes were based on real-life events. They felt incredibly realistic and panic-inducing. Geoff and Cami’s voices were so similar that at times I had trouble telling them apart. Couples who have been together for a while sometimes mimic each other’s mannerisms, but I found it hard to believe that any two people would have nearly identical thought patterns. While their personalities are eventually described in greater detail, it was done through telling instead of showing the reader exactly how Cami and Geoff are different from one another. I particularly would have liked to see more concrete examples of Cami’s love of organization and Geoff’s strong urge to be in the spotlight. The humour in this tale caught me off guard. I was expecting to like it based on how intrigued I was by the blurb, but I never thought I’d find as many things to chuckle over during the course of it as I did. Kidnappings are serious business, of course, but the way other characters react to the disappearance of a man known for pulling outlandish pranks was well worth my time. 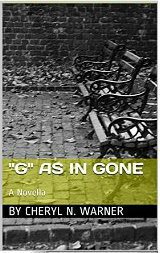 “G” as in Gone is a solid mystery that I’d recommend to anyone in the mood for something modern and funny.